Why 2009 can be better! Here we are in the dying hours of 2008, many people will be look back thinking that this was not a great year, how times were so much better earlier in the decade and how 2009 will simply be worse on all fronts. But 2008 could also be looked at as being the great cleanser - the year that people behind the easy money got found out and the rest of us got educated about the fact that if there is a fast buck to be made then almost inevitably, in the long term, there is some cost. Unfortunately the cost has been borne by many people, not necessarily those who made the fast buck in the first place. 2009 will be a year in which those who believe in ethical ways of conducting life - and business - can come forward with confidence and make a stand against those who present the more enticing, exciting options. Of course many businesses need to innovative and take risks - and there the risk takers will get their way but the new ethic of risk taking should be that the risk taker sees the losses when it goes wrong and there is little or no 'collateral damage'. The age of banks taking risks in such a way that every one of us sees the after effect when the quest for the fast buck goes wrong must be behind us. While Gordon Brown might not turn out to be the person who saves the world, in 2009 there will be the great new hope for the planet - in the shape of Barack Obama. His ethics and idealism seem to be just what we need - the issue is whether he will be strong enough to overcome the entrenched interests of those who got us into this mess. For those who might otherwise look forward to 2009 with nothing but pessimism, Obama presents the potential for a new ethical outlook from the top and exciting changes that could touch us all. Things might be tough along the way but 2009 will be the year of the new clean slate, a year of opportunity for us all to bring the excesses under control and put in place firm foundations for future growth. We're about to print our last t-shirts for this year and we do so with the feeling of quiet contentment that goes with completing a job well done - and also a feeling of relief and exhilaration at being able to forget about it all for a few days spent with families and friends. Fortunately the team here do not have far to go. No long drives across the width or height of the UK in order to be with those closest to us - we're able to pop out to the local and have a final drink together before saying our farewells and meeting up again in the new year. At the pub we might chat about our achievements this year, not just in terms of our growth but also in terms of being able to do so on the back of continuing to promote the ethical and environmental causes in which we believe. We might chat about how the recession might affect the promotional clothing industry and the steps that we can take so that next year we do as well as this year. We might consider what new technologies might come along to help us meet these challenges. On the other hand, in the quiet knowledge that we've been dealing with these all issues in the workplace, what we'll probably do is what we normally do when we get to the pub - talk complete and utter bo! !ocks about music, football and anything else that comes to mind except Strictly Come Dancing! With that profound thought we pass our readers - whether customers past or future - or simply readers - our very best wishes that the festive season brings joy and happiness to you and your loved ones! The smartest young scientists wear Pier 32!! It's too easy to think that Pier 32 is just about custom promotional t-shirts. But that's far from the full truth - we supply all sorts of promotional clothing, from outerwear to vests. You can also have us customise accessories such as tote bags and, in the case of children, bibs. Which is where another of our customers, the Centre for Brain and Cognitive Development comes in. The Centre for Brain and Cognitive Development (CBCD) was founded at Birkbeck College, University of London, in 1998. It has grown steadily and is now internationally recognised as one of the leading centres of its kind. Its mission is to investigate relations between postnatal brain development and changes in perceptual, cognitive, and linguistic abilities from birth through childhood and late adulthood. For adult volunteers, behavioural studies usually take up to 30 minutes and involve watching sequences of pictures or listening to sounds and making judgments about them. With such experiments the Centre study the response time and accuracy of participants to clarify the thought processes (such as attention or working memory) involved in the task. Many studies at the Centre use EEG (electroencephalography). This is a safe and non-invasive method of studying brain electrical activity through a net of sensors placed on a participant's head. The sensors pick up tiny electrical signals that can then be processed to learn more about the pattern of brain activity during the experimental task, (for example judging the similarity of 2 pictures, or detecting previously unseen faces). This technique can be used to answer many different questions. How does the brain extract different bits of information about a face? What happens in the brain when you see a novel image? Do left and right hemispheres process different kinds of information? The Centre also incorporates the Babylab - which is where our bibs come in! 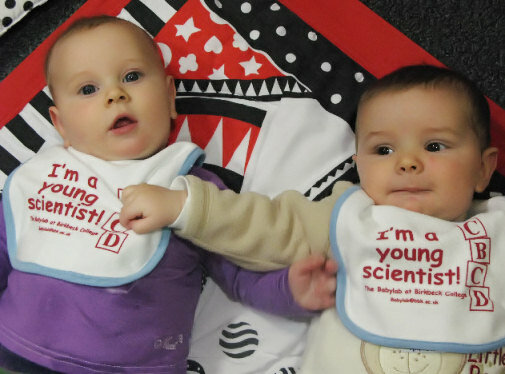 The Babylab studies how babies learn and develop, particularly during the first 2 years of life. Some of the areas investigated include how babies recognise faces, how they learn to pay attention to some things and not others, how they learn to understand what other people do and think, and how their language and understanding of the world develops. Generally studies take the form of simple games in which babies are presented with various interesting things to look at and listen to. Like short video clips or cartoons on a computer screen or more interactive studies involving showing the babies different toys or objects. A researcher might play a game with a baby to understand more about how they think and learn different skills. In addition to studies where they simply observe babies behaviour they also use various methods for measuring brain activity including the EEG 'hairnet' of sensors and the following of eye movements. As well as studying typical brain development in infancy, the Babylab is one of the only laboratories in Europe that studies brain functioning in very young children with autism and William’s Syndrome. We have supplied T-Shirts & Bibs sized for babies of 3 - 24 months to the babylab - and on the front is printed the motto: "I'm a young scientist" - never too young to start! The centre is continuously looking for adult volunteers between 18 and 35 years old to take part in behavioural studies as well as in studies on brain activity, and babies in their first two years. Visit their website to sign up. During the early hours of 27 September a blanket of mist settled over London and the city was at peace. But not for long... as the sun's rays began to break through, hundreds of gorillas emerged from London's streets and a gorilla gathering started to form in the city. 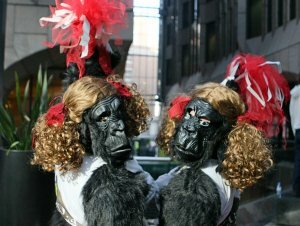 This was the 2008 Great Gorilla Run and it was set to be amazing. By 10:30am over 732 dedicated Gorilla Organization supporters, dressed in their customised gorilla costumes had gathered at the start of the run in central London. This was the first time in history that this number of people dressed as gorillas had gathered in one place making the 2008 Great Gorilla Run a record breaking event! Wildlife conservationist and television presenter Bill Oddie was in great spirits and after an exciting build up, set the gorilla runners off along the 7km route. As the gorillas spread through the streets of London thousands of onlookers gathered and TV crews from around the world captured the moment on film. To date over £250,000 has been raised by gorilla runners for the endangered gorillas of central Africa - a fantastic achievement. Elizabeth Roberts, who raised over £4000 was this year's top fundraiser and as a big thank you for her efforts, adventure travel company Explore, who sponsored this year's Great Gorilla Run, has offered Elizabeth a once in a lifetime trip to see mountain gorillas in the wild in Uganda. No, Pier 32 did not supply the Gorilla costumes! Pier32 supplied ethically produced t-shirts from our African supplier Starworld. To see more pictures from the event, for more information and to sign up for the next Great Gorilla Run on 26 September 2009 visit www.greatgorillas.org. Our congratulations go out to everyone who took part! We have just heard how another of our customers has been using our services to project themselves - not just in the UK but again in Europe. The charity Living Streets campaigns for creating better streets and public spaces to be enjoyed by everyone on foot, with their needs prioritised over traffic. Living Streets also campaigns for more walking on everyday journeys, reducing congestion, pollution and our carbon footprint. The charity runs various campaigns, a notable one being the Walk to School campaign funded by the Department for Transport and the BIG Lottery Fund. That campaign was recently joined by the Walking Works campaign, encouraging commuters to reduce the number of short car journeys they do (20% of journeys being less than a mile!) and walk to the station or all the way to work, with benefits for fitness and the environment. While most of our customers order our personalised t-shirts or hoodies, Living Streets wanted customised rucksacks to be taken by a group of students from Darlington (with funding from Darlington Borough Council and Northern Film and Media) to visit the Walk21 conference on walking and public space in Barcelona. They presented their own ideas to delegates about their ideal walks to school, and grilled the experts at the conference. They are currently editing their experiences into a video. The 5 day experience included travelling to Barcelona and back by sleeper train - quite an experience in itself and rather more beneficial to the environment than flying! As well as attending the conference, they engaged in a range of local activities. This was all part of the Step Up Debate - a national discussion about what changes students would like to see made to encourage them to walk more of their school journeys. Our ethical and environmental credentials at Pier 32 was an important part of Living Streets choosing us as a supplier of promotional products. We are pleased to have played our part in helping them achieve their aims. As well as the Living Streets website at http://www.livingstreets.org.uk/ the Step Up campaign site is at www.stepup.org.uk. At these sites you can not only find out rather more about the charity and its campaigning, but also about the students' experiences on the Barcelona trip.